I’ve been into craft beer since I started drinking. But until recently, I just walked into a store, bought something I liked or sounded good, and that was about it. Since I began reading and then joined Aleheads, I’ve been putting a lot more thought into beer. Why do I like what I like? What are my favorite hop varieties? What new beers do I need to search out and try? All of this takes me down the slippery slope towards obtaining the best beers in the world. The trouble is, with the explosion of craft beer, these coveted prizes can be difficult to obtain. Limited distribution, limited supply, huge demand. So this winter, I have tried to get a number of interesting and limited edition brews, most of which I have to drive an hour to Missouri to get. I failed to get Hopslam, Hoptimum, KBS, etc. Most of these beers didn’t even hit shelves here. They were bought up by distributors and liquor store owners and employees, or kept in the back for friends. Now I don’t have a problem with this practice, all jobs have their perks and this is pretty much the only one in the retail booze business. But the disappointment remained. One exiting beer that did get distributed in KS this year was Goose Island’s Night Stalker Imperial Stout. This beer isn’t as well known as Goose Island’s Bourbon County, but perhaps it was more intriguing to me, since it is a hop-forward imperial. While it probably does age, who wants it sitting around while those delicious Simcoe hops mellow? I thought I missed this one too. I heard that Kansas City’s supply sold out ‘before they hit shelves’ as well. I asked at my local package store, and didn’t hear anything promising. Then, last night, I got the call. They got in two cases of Night Stalker as a ‘surprise’. I was conservative and picked up three bombers. NOTES: 22 oz. Bottle shared with the miss at the Hordeum ranch. APPEARANCE: Pours black as night. The glass held up a light does not change a thing. HEAD: Very little, dark tan. NOSE: Quite piney and earthy. TASTE: Delicious. Thick, rich, sweet roasted malt, lots of chocolate up front. Well balanced with bitter hops, lots of earthy pine, a little bit of citrus, and–what the hell?–passionfruit. MOUTHFEEL: Very smooth, full bodied, creamy, with mild carbonation. The alcohol is completely hidden until the aftertaste, which leaves the mouth a little warm and watering from the hops. DRINKABILITY: Absurdly good. I was taking big gulps and holding it in my mouth as long as I could, not wanting it to go away. Posted in Beer Culture, Tasting Notes.Tagged Goose Island, Night Stalker. Completely agree, Herr – a terrific brew. Interesting that it was in such short demand so close to Chicago. 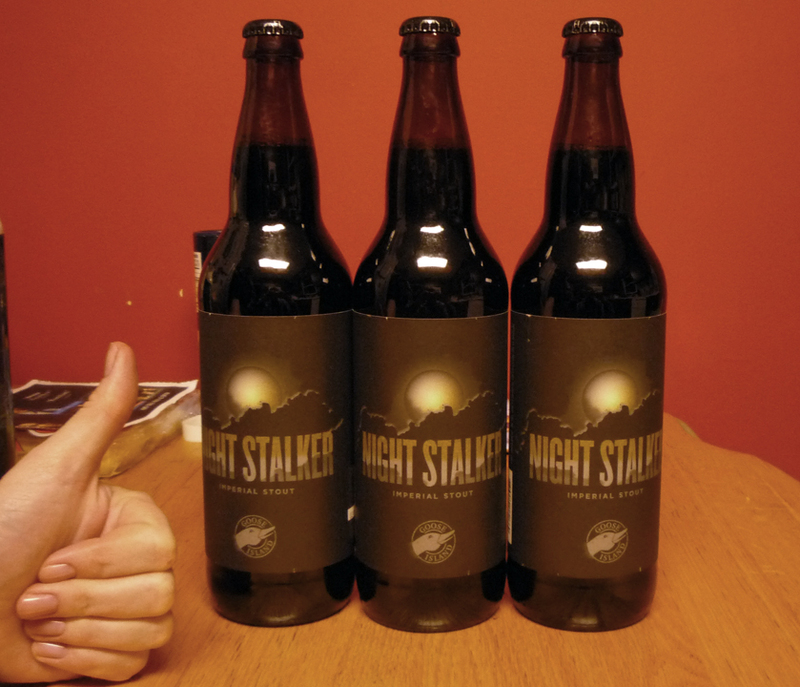 The bottle of Night Stalker I found in Boston and blogged about last June was one of many on the shelf of my local alemonger. It sounds like Goose Island has more or less mastered the fine art of marketing via forced demand. Glad to hear you were able to procure a bottle! Yeah, I can say that here in central Illinois it’s not really considered a “difficult to find” beer and most of the package stores had plenty on the shelves. There’s also plenty of Bourbon County Stout–most of the stores even have multiple years of Bourbon County sitting on the shelves. Just another case where demand is triggered by availability, I suppose. Yeah, I just don’t think much gets sent out this way. Same deal with Bourbon County- I’ve never seen it on the shelf. I think a few cases come in, and its gone. I think craft beer is really kicking in the the KC area. In March/April alone MO is getting distribution for the first time of Firestone Walker, Stone, Green Flash, and Deschutes! Although, true to form, Deschutes is only distributing their year-round selections. I’ll gladly drink some Mirror Pond, but be disappointed that there will be no Abyss, at least for now. It must just be too small a market to mess with. Be glad you’re getting any, there’s no Deschutes anywhere in Illinois. Not even Chicago gets it.